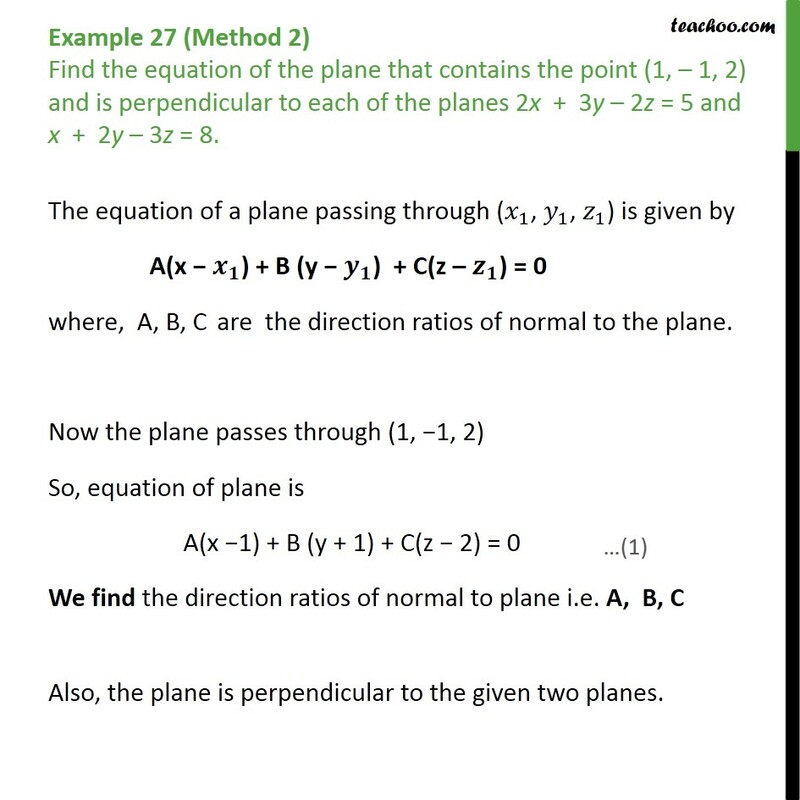 Example 27 (Method 1) Find the equation of the plane that contains the point (1, – 1, 2) and is perpendicular to each of the planes 2x + 3y – 2z = 5 and x + 2y – 3z = 8. The equation of a plane passing through ( 𝑥﷮1﷯, 𝑦﷮1﷯, 𝑧﷮1﷯) is given by A(x − 𝒙﷮𝟏﷯) + B (y − 𝒚﷮𝟏﷯) + C(z – 𝒛﷮𝟏﷯) = 0 where, A, B, C are the direction ratios of normal to the plane. 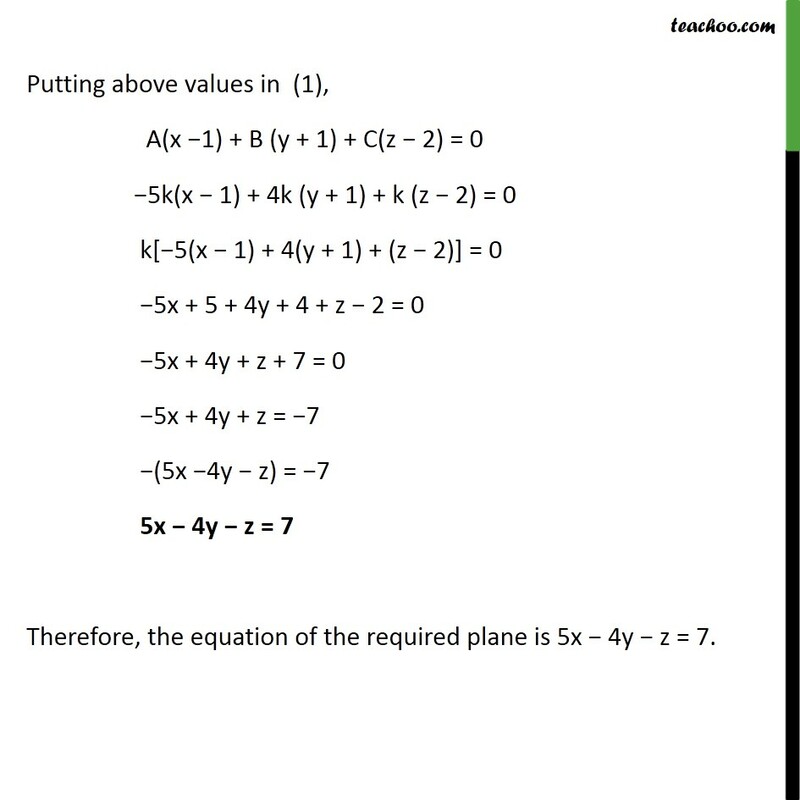 Now the plane passes through (1, −1, 2) So, equation of plane is A(x −1) + B (y + 1) + C(z − 2) = 0	We find the direction ratios of normal to plane i.e. A, B, C Also, the plane is perpendicular to the given two planes, So, their normal to plane would be perpendicular to normals of both planes. 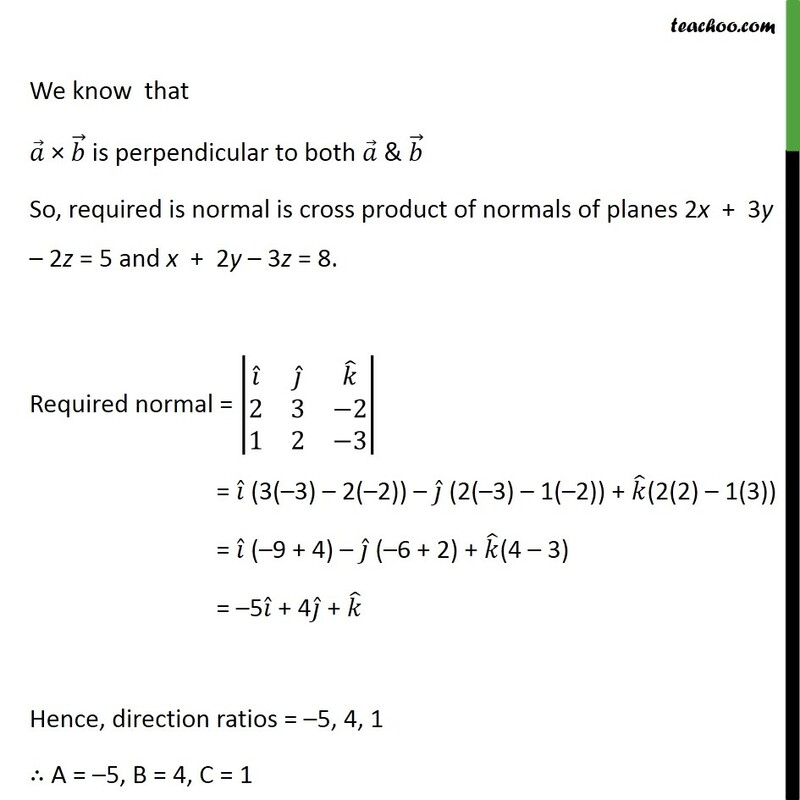 We know that 𝑎﷯ × 𝑏﷯ is perpendicular to both 𝑎﷯ & 𝑏﷯ So, required is normal is cross product of normals of planes 2x + 3y – 2z = 5 and x + 2y – 3z = 8. 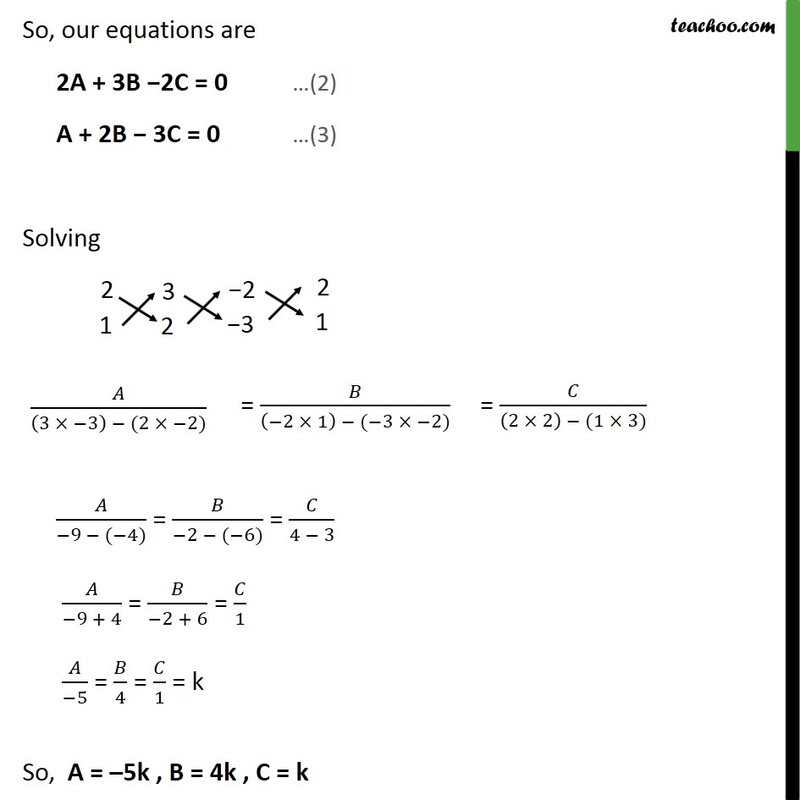 Required normal = 𝑖﷯﷮ 𝑗﷯﷮ 𝑘﷯﷮2﷮3﷮−2﷮1﷮2﷮−3﷯﷯ = 𝑖﷯ (3(–3) – 2(–2)) – 𝑗﷯ (2(–3) – 1(–2)) + 𝑘﷯(2(2) – 1(3)) = 𝑖﷯ (–9 + 4) – 𝑗﷯ (–6 + 2) + 𝑘﷯(4 – 3) = –5 𝑖﷯ + 4 𝑗﷯ + 𝑘﷯ Hence, direction ratios = –5, 4, 1 ∴ A = –5, B = 4, C = 1 Putting above values in (1), A(x −1) + B (y + 1) + C(z − 2) = 0	−5(x − 1) + 4 (y + 1) + 1 (z − 2) = 0 −5x + 5 + 4y + 4 + z − 2 = 0 −5x + 4y + z + 7 = 0 −5x + 4y + z = −7 −(5x −4y − z) = −7	5x − 4y − z = 7 Therefore, the equation of the required plane is 5x − 4y − z = 7. 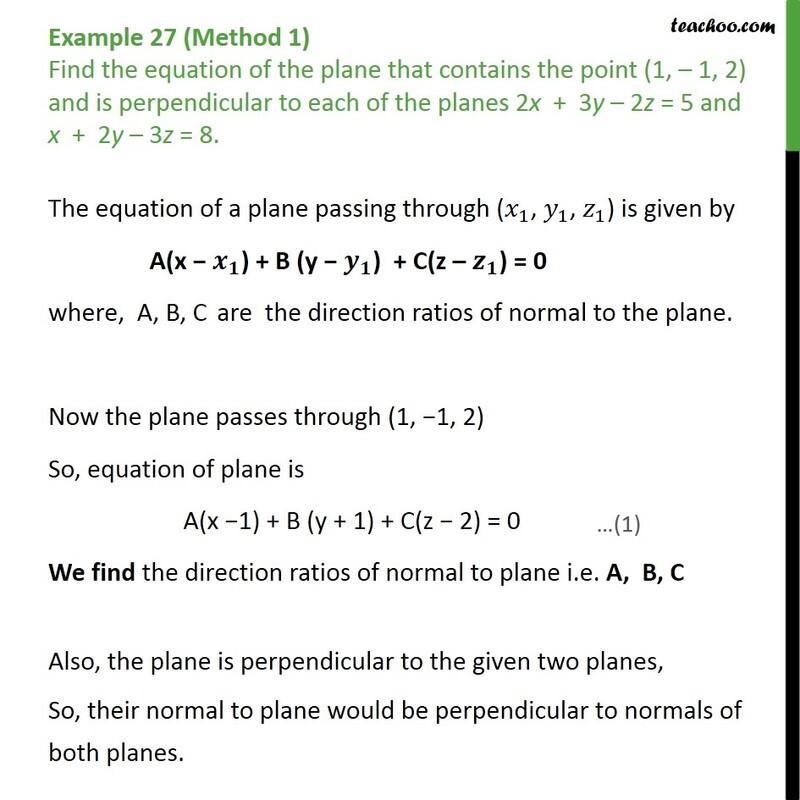 Example 27 (Method 2) Find the equation of the plane that contains the point (1, – 1, 2) and is perpendicular to each of the planes 2x + 3y – 2z = 5 and x + 2y – 3z = 8. The equation of a plane passing through ( 𝑥﷮1﷯, 𝑦﷮1﷯, 𝑧﷮1﷯) is given by A(x − 𝒙﷮𝟏﷯) + B (y − 𝒚﷮𝟏﷯) + C(z – 𝒛﷮𝟏﷯) = 0 where, A, B, C are the direction ratios of normal to the plane. 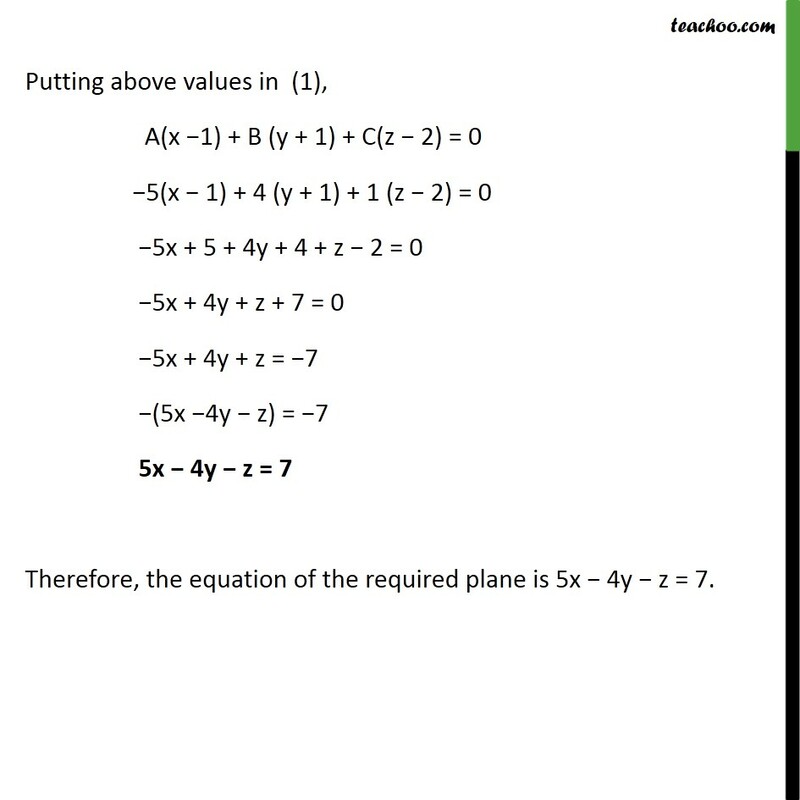 Now the plane passes through (1, −1, 2) So, equation of plane is A(x −1) + B (y + 1) + C(z − 2) = 0	We find the direction ratios of normal to plane i.e. A, B, C Also, the plane is perpendicular to the given two planes. 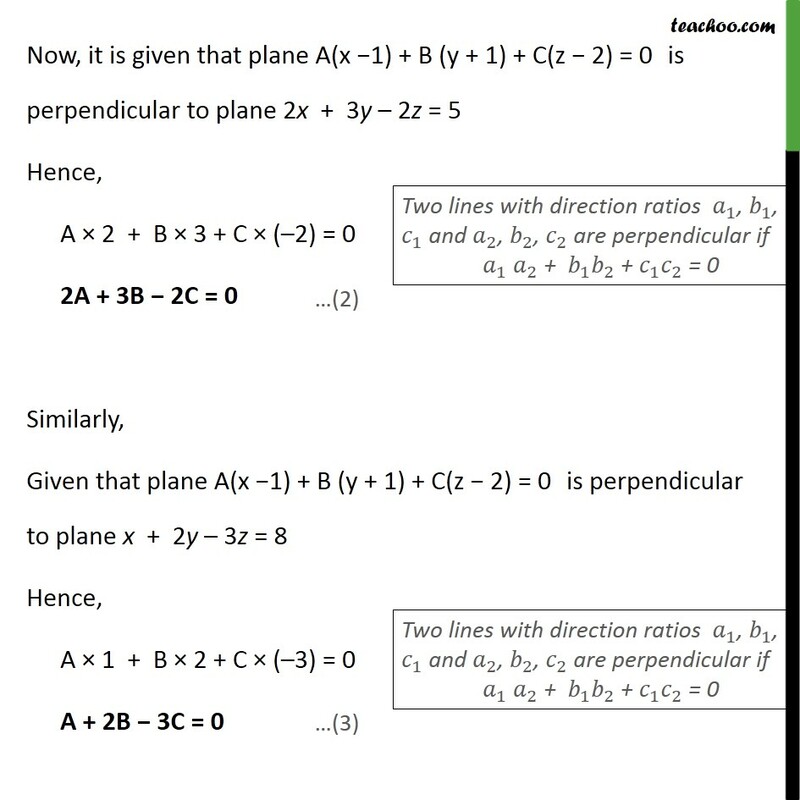 Now, it is given that plane A(x −1) + B (y + 1) + C(z − 2) = 0	is perpendicular to plane 2x + 3y – 2z = 5 Hence, A × 2 + B × 3 + C × (–2) = 0 2A + 3B − 2C = 0 Similarly, Given that plane A(x −1) + B (y + 1) + C(z − 2) = 0	is perpendicular to plane x + 2y – 3z = 8 Hence, A × 1 + B × 2 + C × (–3) = 0 A + 2B − 3C = 0 So, our equations are 2A + 3B −2C = 0 …(2) A + 2B − 3C = 0 …(3) Solving 𝐴﷮−9 − (−4)﷯ = 𝐵﷮−2 − (−6)﷯ = 𝐶﷮4 − 3﷯ 𝐴﷮−9 + 4﷯ = 𝐵﷮−2 + 6﷯ = 𝐶﷮1﷯ 𝐴﷮−5﷯ = 𝐵﷮4﷯ = 𝐶﷮1﷯ = k So, A = –5k , B = 4k , C = k Putting above values in (1), A(x −1) + B (y + 1) + C(z − 2) = 0	−5k(x − 1) + 4k (y + 1) + k (z − 2) = 0 k[−5(x − 1) + 4(y + 1) + (z − 2)] = 0 −5x + 5 + 4y + 4 + z − 2 = 0 −5x + 4y + z + 7 = 0 −5x + 4y + z = −7 −(5x −4y − z) = −7	5x − 4y − z = 7 Therefore, the equation of the required plane is 5x − 4y − z = 7.